The Shenzhen-based drone manufacturer DJI has released a new addition to its Mavic series. The new DJI Mavic Air is an affordable yet powerful drone that records in 4K format. 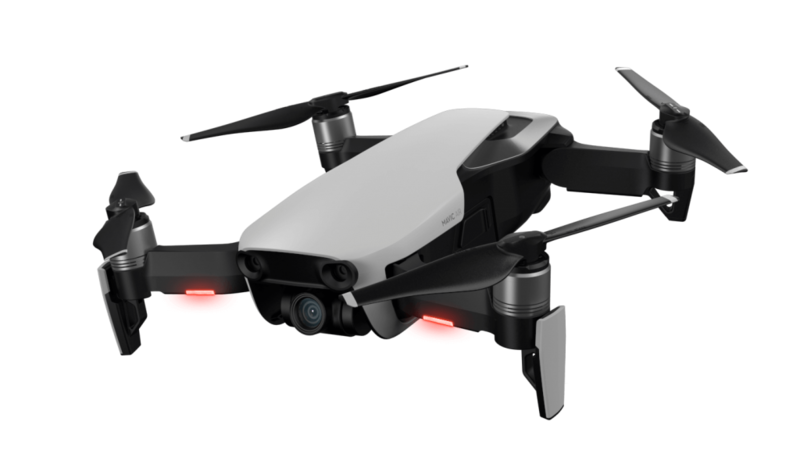 DJI positions the new drone between the high-end Mavic Pro and the mid-range DJI Spark. DJI Mavic Air is a foldable drone, which means that it can easily fit into a small bag when the arms are folded. Hence, its portability is much better than DJI Spark. Image source: DJI. Mavic Air fits into a small bag when folded. The 8 MP resolution camera is located at the front and utilises a 3-way gimbal for image stabilisation. It’s possible to reach 32 MP resolution for panoramic sphere photos by “stitching” 25 photos together. Moreover, the camera records video in 4K format at 30 fps (frames per second), which is a notable improvement compared to Spark drones. The battery powers the drone for a maximum of 21 minutes of flying time compared to only 16 minutes for the Spark model. The internal storage equals 8 GB and there’s a Micro SD slot available in case more storage is needed. Flight features like obstacle detection sensors are included as can be seen in the promotional video below. Pre-orders will be available shortly. You need to place your order quickly if you wish to become one of the first owners in New Zealand of the new Mavic Air. Shipping starts on the 28th of January for arctic white drones. The price is US$799 for the base model and the combo costs US$999.